Golden State Warriors forward Draymond Green (23) in front of Philadelphia 76ers guard Ben Simmons (25) after being called for a foul during the fourth quarter at Wells Fargo Center. The Philadelphia 76ers have fined veteran center Amir Johnson for his use of a cell phone during Saturday's playoff loss against the Brooklyn Nets. One NBA player thinks the outrage against Johnson and Joel Embiid, who also was caught glancing at the phone, is overblown. 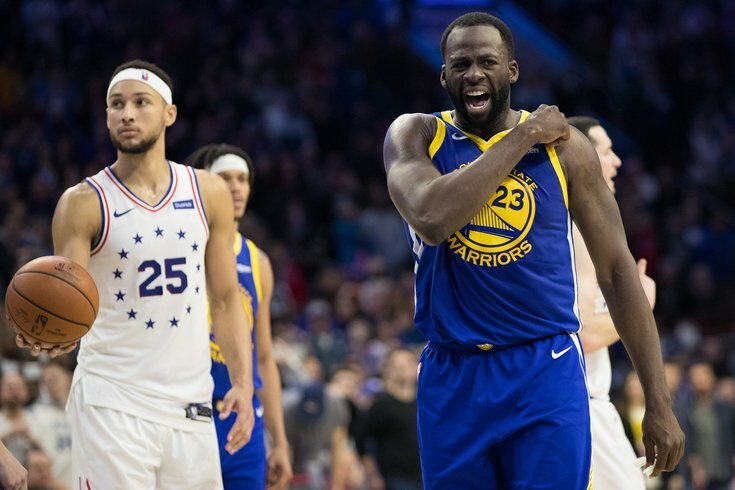 Golden State Warriors forward Draymond Green responded to a fan's reaction by calling out the hypocrisy of Johnson and Embiid's critics. In a general sense, Green has a point. There are many jobs in which casual use of a cell phone does not represent a problem or a serious threat to productivity. Other places of work, particularly those with inherent job-related dangers, are less likely to be tolerant of cell phone breaks. It depends on when and where. For the Sixers, the optics simply looked bad on Saturday as Philadelphia fell to the Nets at home in game one. Would it have mattered as much if the Sixers had been coasting to a win? At his post-game press conference, Embiid explained that he glanced down at the phone because Johnson's daughter was sick. Embiid is not facing any fines or disciplinary action. Johnson issued a statement of apology after the game and later addressed his teammates before the start of practice on Sunday, taking full responsibility for what happened. Green is one of the feistiest and most infuriating players in the NBA, so much so that Charles Barkley said last year he'd love to punch him in the face. It's unlikely he's going to win this argument with most fans, especially purists who believe incidents like this are a disrespect to the game, but he does deserve some credit for putting the issue in perspective — especially if you're reading this at work.